Recently United Hospital Limited signed a Corporate Medical Services Agreement with Sir John Wilson School. Under this agreement Managements, Faculties, Employees, Students and their Parents of with Sir John Wilson School may avail special healthcare facilities at United Hospital Limited. This is another commendable step by United Hospital to further take its medical services to educational institutes, providing support to institutions who nurture today's students who will tomorrow form the backbone of the country. 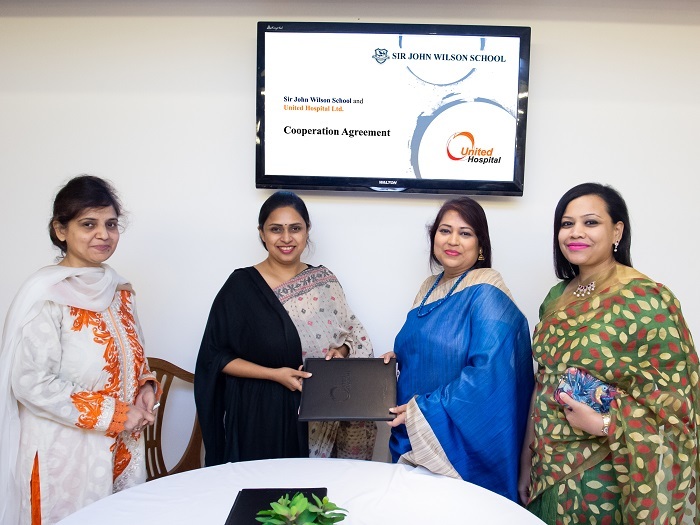 Dr. Shagufa Anwar Chief of Communication & Business Development of United Hospital Limited and Sabrina Shaheed, Principle of with Sir John Wilson School were the signatories from both institutions. Hasan Mahmood Raja, Honorable Chairman & Mr. Moinuddin Hasan Rashid, Managing Director of United Group & the other board members of United Group and other officials from both the institutions were also present in the Signing Ceremony.